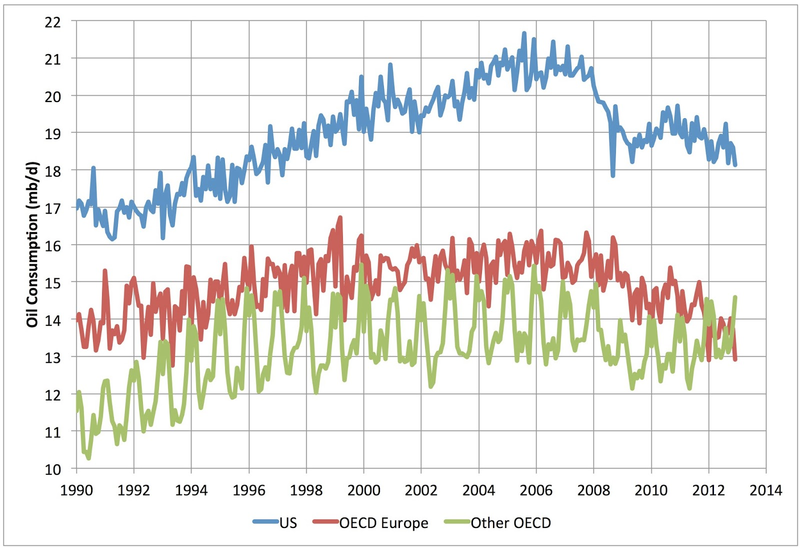 Here's a slightly more detailed look at OECD oil consumption than last week, based on the EIA monthly data. Here's the history since 1990, broken down into three major regions (the US, Europe, and everywhere else in the OECD: Japan, Korea, Canada, Anz, etc). US oil consumption is falling; the US economy is growing slowly, but the US is growing more oil efficient faster than that. 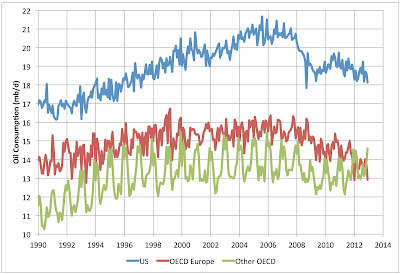 Europe is contracting economically, and this shows up in sharp falls in consumption. Meanwhile, the rest of the OECD is doing somewhat better economically and it's oil consumption is growing. Probably the largest prospect for a near-to-mid term exogenous change in this situation is if European policy were to turn around and become less austerity focussed so that Europe could begin to recover. 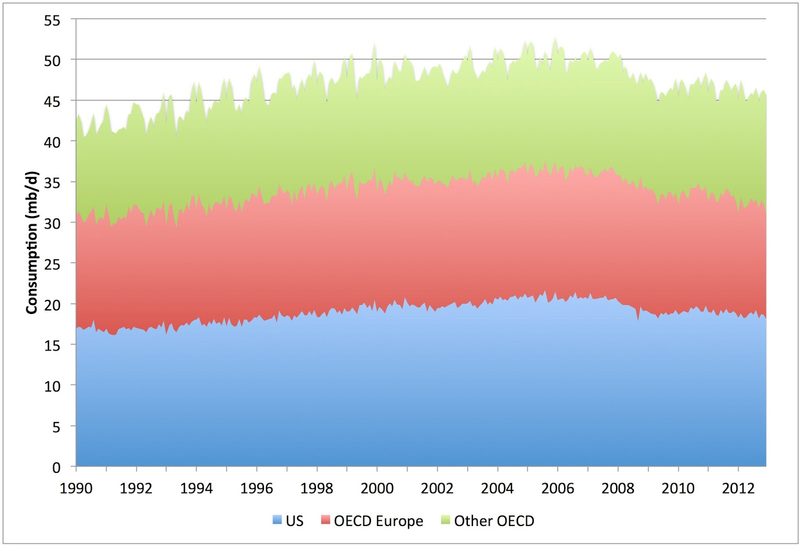 That would likely slow or end the decline in European oil consumption. Of course, higher oil prices would likely drive all regions to conserve more rapidly. "US oil consumption is falling; the US economy is growing slowly, but the US is growing more oil efficient faster than that." The "US economy is growing slowly" is it really or does it just seem to be growing slowly? 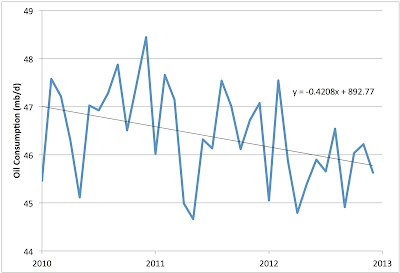 Is there any real evidence that proves "the US is growing more oil efficient faster than that"? 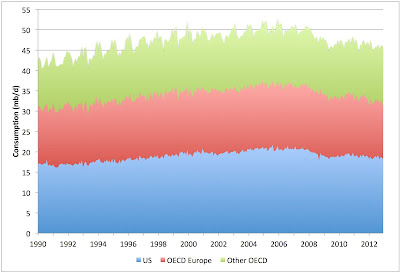 To what extent is increasing "US oil efficiency" a euphemism for more and more people finding lifestyles that revolve around oil consumption less and less affordable? I'm curious about short-term elasticity vs long-term. The taxi industry knows that hybrids are cheaper than pure ICE vehicles. Similarly, solar has reached grid parity, and it's growth is accelerating. How soon will we reach a tipping point (an "oil singularity"), where EVs (hybrids, PHEVs, EREVs, and pure EVs) become so obviously cheaper and better that oil consumption starts to drop sharply and permanently? The tipping point is determined by cost. For many people, it has passed. Per capita US consumption is down almost 15% since 2007. Mostly less driving (and flying) rather than more Priuses. I've been watching climate/energy issues for three decades. It's been an interesting journey. It's more than a little like watching a drunk struggle with drinking. Dozens of excuses why it's not a problem, I can quit any time I want to, the problem is my wife/job/debt and the list is long. In three decades, climate has become ever more "irrational", energy consumption continues to rise (not a problem as didn't go up this yr so that's a lie), ever more people in poverty, energy costs ever higher, we're now mining oil instead of pumping it, CO2 levels just keep climbing, Arctic ice is about gone in the summer, we're now trading blood for oil (not a problem, it's other people's blood), endless solutions that don't work and the list goes on. The most interesting thing of all is how easily the human brain can rationalize away any and everything. It's all BS folks!! We are in one helluva bind and no amount of debating who did what, to whom and when matters at all.